Eve Makis on Bringing a Community to Life. 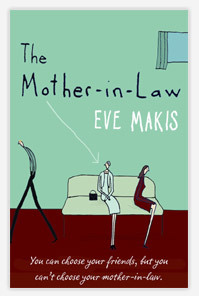 Eve Makis’s books may appear to be light reading, but like many books of this genre, there is an underlying narrative about life; in many cases delivering unique insights into communities many of us do not have access to. Eve is currently living in Cyprus, so is experiencing the effects of the crisis out there first hand. But it hasn’t slowed her schedule and as well as developing new work, she is also teaching creative writing. One of her students, Zoe Piponides, came in the top 6 of the Alan Sillitoe Poetry Competition in Nottingham, receiving a commendation for her entry. How much of your own life informs the narrative of your novels? My first book was totally ‘write what you know’, about growing up in Nottingham as the daughter of Greek Cypriot parents who came to England in the 1960’s. I wanted to portray a community hitherto unexplored in mainstream literature, i.e. the Greek Cypriot community, and I did this by drawing on my own life experiences. Like my protagonist, Anna, I grew up above the family fish and chip shop and had a fight on my hands when I wanted to leave home and study. Girls of my generation only left home with a ring on their finger. 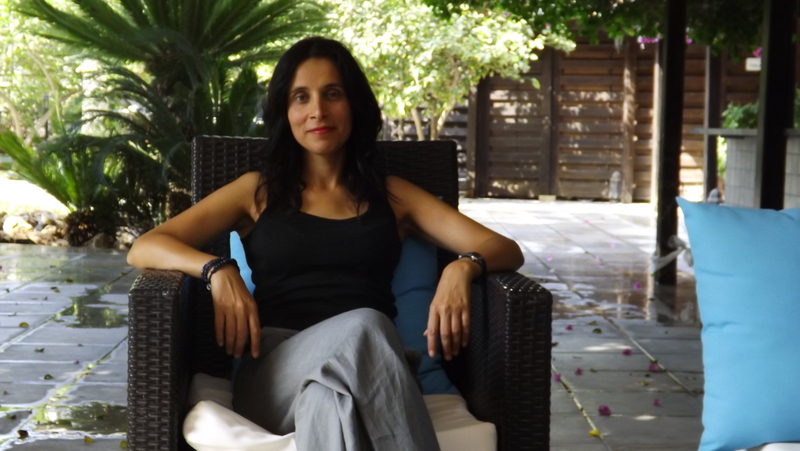 I never set out to write a novel simply about teenage angst, but to explore my culture on a deeper level, its folklore, traditions and history, so the story of Cyprus is also told through the lives of the family in my book. My second book was less about my own life but still influenced by my culture and interests. It’s the story of a vivacious Cypriot woman, Electra, married to a mild-mannered English man and about the cultural differences that enrich and disrupt their relationship. Electra tries to retain her national traits even though she’s far away from home – which is something most of us do when we live abroad. My husband is a native Cypriot so I have experienced this longing for home first hand. The novel also explores Cypriot history and in particular the division of the island in 1974. Book three, Land of the Golden Apple, was based on the stories my husband told me about his magical, outdoor childhood in a Cypriot village. This was cut short in 1974 when the island was divided and he lost his home. However, his formative years were one big adventure. He lived a kind of Huckleberry Finn existence, climbing trees, fishing, exploring potholes, basically running free. But he was also fascinated by explosives (a legacy of the island’s turbulent past) and got up to some very dangerous stunts, including blowing up part of the village church. 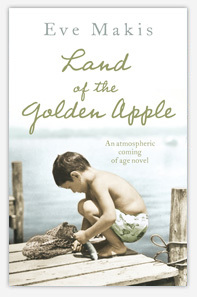 Land of the Golden Apple is about an intrepid boy who crosses the line, about a seemingly idyllic village where dark secrets lurk. Your novels have elements of comedy and more serious undertones. How do you keep the balance between the two? I think of my books as having a light surface and a darker underbelly. I like characters who see the world through a skewed, satirical eye, like Anna in my first book They are characters who aren’t afraid to laugh at themselves. This keeps me entertained when I’m writing and makes serious issues easier to tackle. I like black humour but I don’t use it to mock or trivialise – it’s more light relief. In my daily life I generally try to see the funny side of things that might otherwise really irritate me. I love clever, British, self-deprecating humour, as well as black, irreverent Greek humour. 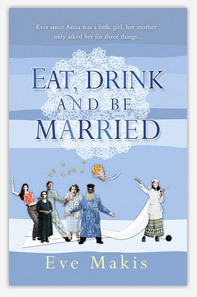 Why put recipes in Eat, Drink and be Married? That was my editor’s idea. She liked the descriptions of food in the book, the lavish family meals and thought it would be nice to include family recipes. I know some readers have attempted the dishes – I’m ashamed to say I haven’t. As my mother announced publically at my first book launch – my daughter only writes about Greek food she doesn’t know how to cook it. The characterizations are very strong in your books. How do you do this and do you see this, rather than the general narrative, as a driver for the plot? None of my characters are completely made up. I usually focus on someone I know. I’ve had some very colourful and interesting characters in my life, including a fortune-telling grandmother who practiced kitchen table magic. As a child I spent many summers in Cyprus and met people who were worlds apart from the residents of my sleepy Nottingham suburb. These Cypriots were archetypal village characters with big personalities and interesting, weather beaten faces. Some of the characters in my books may seem like caricatures but I can assure you they’re not – they’re very real and perhaps even played down. After you’d written the first book, how difficult was it getting up steam to move onto the next? After my first book was published I got a two book deal so I just had to get my head down. It wasn’t that difficult because I was in the habit of writing by then, but I did feel like I was writing to order. I liked having a deadline because it made me more disciplined and the end was always in sight. What I would give for a deadline now. My fourth book is taking forever to write. How helpful was your background as a journalist when it came to writing novels? In hindsight, I think it has been very helpful. I used to think journalism was a wrong career move but now I’m really glad I had a life before writing. Life since journalism has been pretty solitary and desk bound. I worked on local newspapers in the UK and as a freelance journalist and radio presenter in Cyprus. I got to know the island more intimately and a lot of the primary research I carried out proved very useful when I started writing my books. Have worked as a journalist I know what questions to ask when I’m interviewing people and I’m quite thorough about checking my facts. I can also do shorthand which means interviewees can’t read what I’m writing. You’re a busy mother. How do you organize your day so you can write? Writing and my family are my two main priorities – I concentrate on those two areas of my life at the expense of other things – i.e. a social life. I don’t believe you can have everything. I feel very lucky to have a job that has allowed me to raise my children. I work when they’re at school, when they’re keeping themselves busy and when they’re in bed. Over the years I have become adept at switching from mother-mode to writing-mode and using my time wisely; mulling over plots while I’m washing the dishes or engaged in some other mundane domestic task. I find the less time I have the more writing I do. You’re developing a script for Land of the Golden Apple. How did this come about? How easy was it to write the screenplay for the novel? How different was it to writing the novel? separated in tragic circumstances), when I decided to adapt my third book. I was really tired, needed a new challenge and a break from writing novels, but not a break from writing. My third book was still very much alive in my head, very vivid, and, in my mind, very filmic. I knew Spielberg would never come knocking, so I bought an idiots guide to screenwriting and spent six weeks writing a script. I really enjoyed the process and, at the time, I thought it was relatively easy. I have since discovered that what I wrote was a million miles away from finished and a far cry from industry standard. It is entirely different to writing a novel, more formulaic, at least for me because I’m still learning and what works in a book doesn’t always work on screen. Are any of your books going to be transferred to the Kindle format at any stage. Yes, but I don’t know when. Thank you, both, for introducing me to Eve’s books. Characters with satirical outlooks appeal to me a lot. Thanks Christina. I think Eve’s books do provide some wonderful insights into this interesting community. « Ian Parks and his Version of the North.